In the ongoing hunt for awful xmas sweaters, I see many vintage Nordic and Icelandic woolens that are mistakenly tarred with the ugly brush. Listen up, vendors. 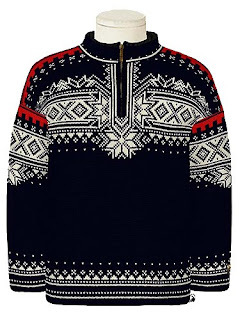 Traditional vintage Nordic and/or Icelandic jumpers are not ugly. They are beautiful. And warm. And significantly undervalued by you dumdums, but that's your loss and our gain. Moreover, both Nordic (originating in Norway) and Icelandic sweaters date back to Viking times and hence have a pedigree whose bravery and honour and handsomeness you'd be foolish to slander, because those ghosts are just spoiling for a fight. That settled, on to the commonalities. In both countries, local sheep supplied the wool, which in the earliest days was undyed. This meant the hues were limited to cream-brown-grey-near black. The jumpers were knit in pullover, and later, cardigan styles, the latter closed with clasps, buttons, or zips. Any decorative pattern was limited to the neckline, shoulders and sleeves, for the bottoms would be tucked into the trousers for added warmth and waterproofing (wool is an excellent repellant of water, which is why subarctic fishermen are so fond of it). Now for the dissimilarities. 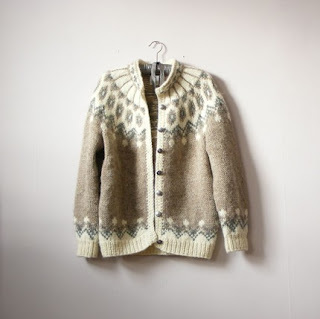 Icelandic sweaters (lopapeysa) typically have a bold yoke design that is symmetrical on front and the back. The wool is usually left in its natural state, so appears in the soft brown/greys mentioned above. More importantly, Icelandic lopi wool is not spun before it is knit, which gives these sweaters their characteristic hairiness--resembling mohair. According to Wiki, this lofty quality helps retain more air close to the body, hence greater warmth. Nordic sweaters are made with tightly spun, long-fibred wool which yields a compact knit (frequently in a herringbone array, again for improved insulation). The wool is usually dyed in navy, deep greens, deep reds, and white. The small-scale zigzag patterns and motifs (snowflakes, reindeer, etc.) that run across the chests, shoulders, and sleeves tend to be typical of the village in which they were created, much as the colors and scale of Scottish tartans indicate the clans from which they originate. Nordic sweaters may be found with pewter clasps as closures, embellished with Viking motifs. Pia's Scandinavian Woolens is a superb visual resource if you're seeking the origin of a vintage find--it's also quite nice if you want to buy one new. Below, a fine example from Dale of Norway, a premiere maker of this type of garment. Buyer's tip: if you want a fantastic deal on a beautiful traditional knit, keyword ugly sweater. In there, past the kitties and scotties and terrible, terrible teddy bears, you may find a fine Viking to take home.